My production machine at work is a Debian box, so I've been relearning all the Year of the Linux Desktop things. I couldn't remember what I used to use as my RPN weapon of choice, but a quick apt-cache search found me this rather handsome little unit by Simon Floery. If you're in Scientific Mode, you can just click RPN in the display. 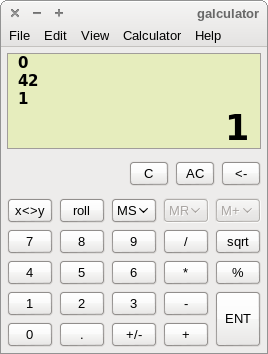 Otherwise, choose Reverse Polish from Notation Modes on the surprisingly‐titled Calculator menu. Update: Turns out that RPN calculator I used to use was the venerable xcalc. That could be activated in RPN mode, and themed. How very retro, and meta.